Dinosaur fossils have been found in the hillsides between Patagonia and Sonoita in the Fort Crittenden Formation. 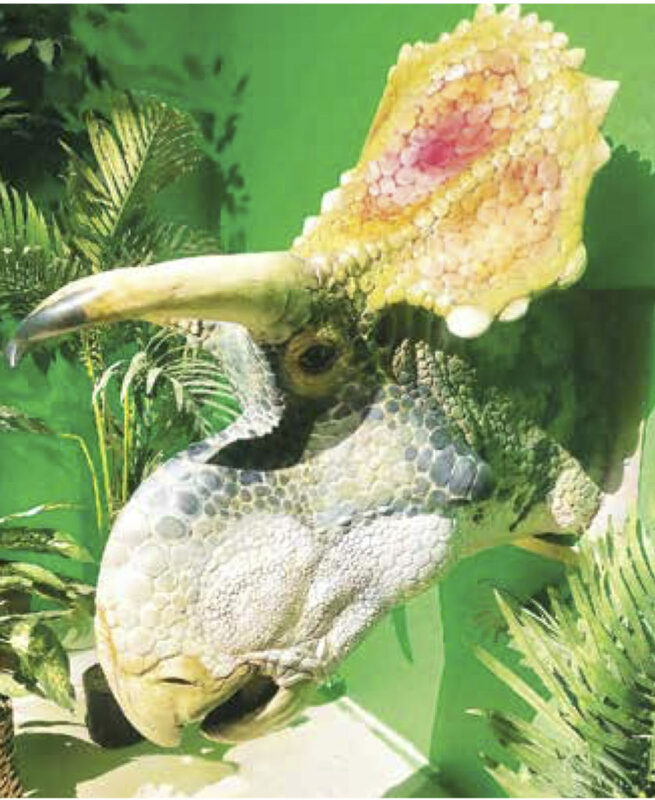 This new species is called Crittendenceratops krzyzanowskii. C. krzyzanowskii, was a plant eater that was about 11 feet (3.5 m) long, and weighed an estimated 1,650lbs (750 kg). The name loosely translates as ceratops (type of horned face dinosaur like triceratops) from the Fort Crittenden Formation (which was named after the Army Post of Fort Crittenden near Sonoita) found by the late Stan Krzyzanowski in 2000. The fossils have been in storage in New Mexico until further study brought to light that it was a new species of dinosaur. What did this corner of Santa Cruz County look like in the Late Cretaceous, 75 million years ago? According to articles and Fort Crittenden Formation expert Robert McCord, Curator of Arizona Museum of Natural History in Mesa, AZ, this area was at a relatively high elevation with rivers and streams that flowed into lakes between mountains. Active volcanos and a few recently extinct volcanos dotted the landscape. Some were on the on the west side of the Santa Rita Mountains. Others were near Tombstone, the Tucson Mountains, the Silverbell Mountains, and the Sierritas. The most important volcano was in the vicinity of Mt Fagan near the Rosemont Mine. When this volcano had its last major eruption, it buried the region in ash, pretty much ending the dinosaur friendly landscape. Before Mt Fagan erupted, the area was forested with trees. Paleontologists have located pieces of petrified wood. However, those pieces can’t tell us exactly what kinds of trees grew in our area. We do know that among those trees roamed tryannosaurs (not T. rex, but a less famous cousin), another large carnivore that is still being investigated, and other smaller carnivores. The prey for these mighty hunters included herds of hadrosaurs, also known as “duck billed dinosaurs”. Hadrosaurs were herbivores that roamed the land along with ceratopians like the C. krzyzanowskii. Paleontologists have even discovered fossilized eggs north of Sonoita, establishing that some dinosaurs were using this general area as a nursery. In the rivers and streams swam garfish, bowfin, and other types of fish with no known modern forms. Even an alligatoid (broadly related to modern alligators) hunted the waters. Clams and snails lived on the shorelines and four types of aquatic turtles also called the waters home. Three of those turtles were soft shelled and one was a hard shelled named Adocus. If you have kids or have ever watched the PBS cartoon, Dinosaur Train, you will recognize the character, Adam Adocus, who is based on the Adocus genus. This region also has a few firsts, besides C. krzyzanowskii being discovered here and being new to science. The first dinosaur eggs be discovered in Arizona were located north of Sonoita. Also the first ankylosaur (a type of armor plated dinosaur) from Arizona was also unearthed north of Sonoita. It is hard to resist looking at the landscape differently after learning about the animals that once lived here. I imagine not herds of pronghorn, but herds of hadrosaurs quietly grazing. Instead of a box turtle, an Adocus peaks out from its shell. Not a coyote moving through the grass, but an alligatoid silently glides through the water. I also wonder what is waiting to still be discovered in this little corner of paradise. It just lies there waiting to be found.